Thus, both the National Security Strategy and the State of the Union Address elevate the threat of AGW, such that it exists on par with the direst perils facing America. 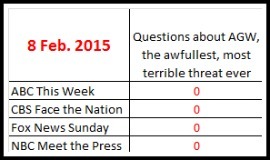 And yet, for the third weekend in a row since the State of the Union, and only days removed from the roll-out of the National Security Strategy, the four Sunday political talkies failed to field a question about climate change (see chart). Of course, all four shows dealt squarely with ISIS and the Ukraine, which are co-equal threats with climate change, per the White House. For example, NBC Meet the Press host Chuck Todd scored the sole interview with Secretary of State John Kerry, who wears on his sleeve his belief that climate change is among America’s clearest and most present dangers. The host is no dummy; he’s perfectly aware that Kerry would love nothing more than wax lyrical about the putative threat posed by global warming. Nonetheless, Todd grilled Kerry about the Middle East and Eastern Europe, and he even asked him whether he would rule out another run for President in 2016, but he didn’t ask Kerry a single question about climate change. On Saturday, I blogged about Friday night’s Real Time with Bill Maher. To be precise, I noted a bizarre rant, during which the host said that we perfectly understand the climate, but we “don’t know” about vaccines, fake sugar, genetically modified foods, and the benefits of moderate drinking. Alas, in that post, I failed to make mention of the excellent riposte to Maher’s delivered by the Weekly Standard’s John McCormack, who was a participant on the panel. After Maher impugned AGW “deniers” and defended anti-vaxxers (and anti-GMO folks and people who don’t trust fake sugar), McCormack responded: “There is an MIT professor, Richard Lindzen, who is a climate skeptic. And I’d say that there are no serious professors who are vaccine skeptics, that I have seen.” Zing! Finally, I’ll recount a tale of heartbreak. Readers of this blog know that I am a big fan of the recently discontinued Platts Energy Week with Bill Loveless. So I was like a kid on Christmas when I checked Platts’ old 8 AM slot on the local CBS affiliate, and I see that they’re going to re-broadcast the original episode, from March 2010. My mind exploded with the possibility that the local affiliate was going to show some classic Platts. Alas, it was a mistake. 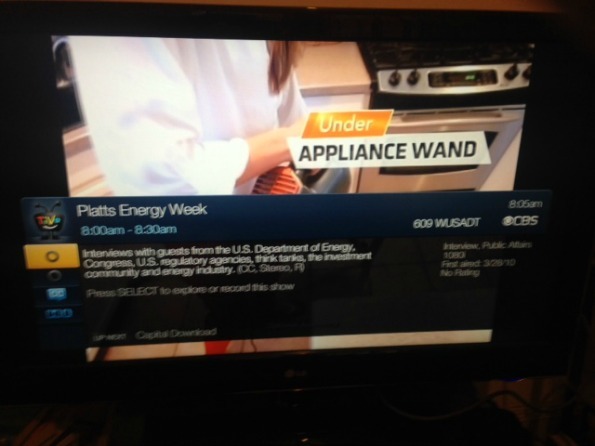 While the label said “Platts Energy Week,” the content was an infomercial for a vacuum cleaner. I’ve reposted a screenshot below.